USGBC and partners in policy have achieved a lot this year in green building for California. There’s a reason USGBC® gives out those funny green hard hats in Sacramento every year. This June, they went to Assemblymember Phil Ting and Assemblymember Richard Bloom for their outstanding leadership on our issues. Very special recognition and a salute also went out to NRDC’s Annie Notthoff and California Department of General Services’ Daniel Kim. The Green Hard Hat Award is a continual reminder that lawmakers, policy implementers and partner organizations in California work with one another and with USGBC to craft policy, implement programs and direct funding for a greener, more sustainable California. Now that the state legislature has closed its doors, we can again say that this year is no exception (see our 2015 wrap-up). 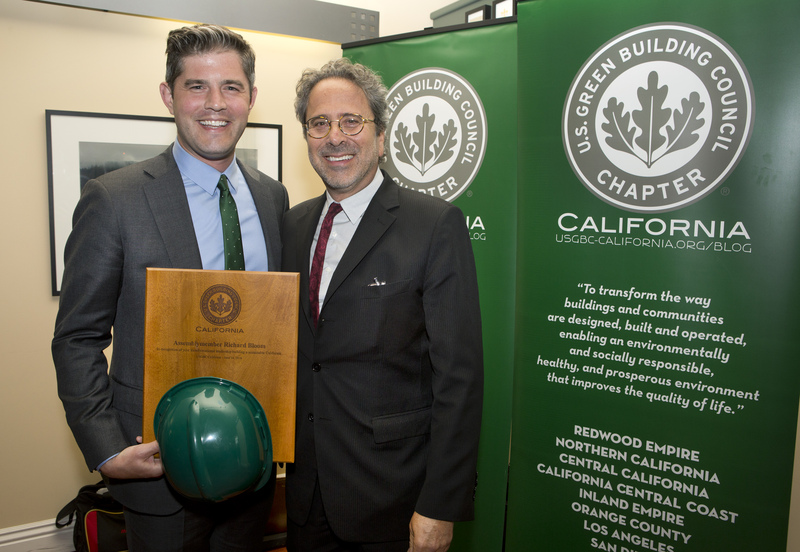 In June 2016, Assemblymember Richard Bloom (right) was presented his Green Hard Hat Award by Brenden McEneaney (left) for his work on energy, climate, housing affordability and land use. By far the biggest news out of Sacramento this year is California’s update to the state’s already ambitious climate change goals. Adopted in late August and signed into law by Governor Brown last week, SB 32/AB 197 commits the state to a 40 percent reduction in 1990-level greenhouse gas (GHG) emissions by 2030. For those who want a background, Vox has published an excellent and thorough primer on the state’s climate policy. In other big news, $900 million from the state’s cap-and-trade fund was set aside in the state budget bill (SB 1613) for a one-year spending plan prioritizing transportation systems and urban areas. Advocacy efforts focused on equity and environmental justice successfully helped prioritize these investments to focus on disadvantaged communities and places that have already borne the brunt of environmental impacts such as harmful air quality. With this exciting new allocation, however, comes news of uncertainty for the state’s cap-and-trade program. The clean energy community is watching closely as a long-fought battle continues over the authority, legality and design of the program. Lawmakers may be compelled to deal more directly with these questions next session. As the California drought continues, so does our work on water efficiency. In addition to extensive programming on green building and water this year, we have also supported the state’s Model Water Efficient Landscape Ordinance and worked with BSC and HCD on updates to Title 24 following the implementation of AB 2282 of 2014 on recycled water in buildings, a bill that we fought to adopt. We’re also working with our community to expand the impact of LEED to save California water. SITES also offers a new set of tools for optimally managing landscape ecology and hydrology in the context of the drought. At the local level, USGBC Northern California is continually engaging in education, outreach and programming that is sparking innovation, nurturing leadership and driving change. From north to south, these myriad local activities are cultivating momentum for market transformation toward green buildings and infrastructure, some of which will necessitate policy action. One such example is USGBC San Diego’s work to support the city’s aggressive climate action plan, adopted at the end of 2015, and now in the first year of implementation. In addition, USGBC Los Angeles has been an active participant in the City of L.A.’s working group on energy and water efficiency in existing buildings, which is has helped to produce its forthcoming Existing Building Energy and Water Efficiency Ordinance. USGBC Los Angeles's work with L.A. County on its Net Zero Water Ordinance is ongoing, including an upcoming work session at WaterBuild. Recall the saying: “As goes California, so goes the nation.” Once again, we’re proud of our advocacy and policy work across the Golden State that keeps California in the lead. We look to our peers across the U.S. to help others follow along quickly. Join us at Greenbuild to learn more and take action!